It was announced last week that North Park's Sea Rocket Bistro would be closing after service on December 8, and with that news, the natural question was where would Chef Tommy Fraioli be heading. The young and talented chef has made quite the name for himself in San Diego, even taking home the coveted Chef of the Fest honor at the 2012 San Diego Bay Wine & Food Festival. We caught up with Chef Tommy who revealed that he will soon journey to Bird Rock to join Chef George Morris at Beaumont's Eatery. The combination of chefs George Morris and Tommy Fraioli is no doubt a culinary dream team. Both pride themselves on focusing on locally sourced, seasonal ingredients and utilizing modern culinary techniques to create playful dishes with a contemporary twist. Fraioli has stated that he will work under Chef Morris, at least for the first year, in order to get a handle on Beaumont's kitchen and menu. Last year, Beaumont's revamped their menu, performed a partial remodel and added Chef George Morris. Beaumont’s Eatery came to Bird Rock in 2005, when the area was burdened with struggling businesses, frequent building foreclosures and a lost sense of community. Since opening, Beaumont’s continues to breathe new life into the community, enhancing the growth and improvement of local businesses and portraying Bird Rock as a vibrant and diverse neighborhood once again. 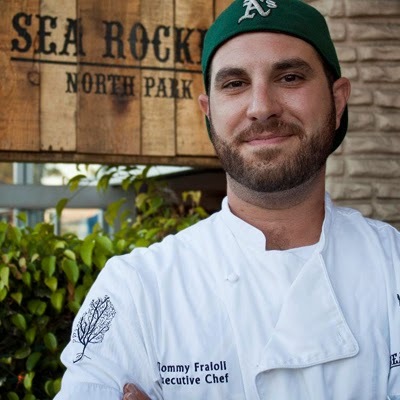 The addition of Chef Tommy Fraioli should only further elevate Beaumont's as a San Diego dining destination. Beaumont's is located at 5662 La Jolla Blvd. in Bird Rock. Visit beaumontseatery.com to learn more.